This is a test of a grafted chilli (F1? )â€“ which claims 25% or something more fruit. I was pleased with results but canâ€™t really 100% verify that sort of claim without a control any more than Iâ€™ve definitely had better results of F1s. Big chillies you generally get less fruit and this was big with pretty fair yield so it is very possible. Lovely big fat, what I would call â€˜vegetable styleâ€™ chilli (maybe 15cm long? ); lovely thick flesh. Itâ€™s nice and substantial when you tuck in â€“ a rather gentle flavour with no bitterness and a strong impression of wet/wateriness with some decent sweetness. Heat wise there is almost nothing then it builds to s tickle on the throat and tongue â€“ starts to get hotter; for me a comfortable easily tolerated level then starts to dissipate fairly quickly. Pretty mild. Ate most raw because they are nice and fresh and better than sweet peppars but great to cook due to size; halve, deseed and fill with some cheddar cheese and a little olive oil and grill. I bought one of these Big Devil grafted plants from Waitrose about 6 weeks ago. At the time it had a couple of open flowers and quite a few buds. I planted it outside the next day. The plant itself has bulked up beautifully with lots of flowers at various stages and there are three plump green chillies about 4.5 inches long already. Once the fruit sets, it only takes about three weeks for them to reach this size. I'll let you know when they turn red. The pests have been quick off the mark, too, with white egg-casings on the upper leaf surfaces and somewhat deformed new leaves. I gave it a mild Neem oil and soap spray last night - hopefully that will slow the Bug***s down a bit. Photo of my Big Devil (grafted) - starting to colour up now. Getting rather crowded in there! That's a very impressive yield from a plant that size. Cheers, Mitzi, I agree. Some of them are about 7" long - and there's just as many on the other side too! I suspect it's going to need canes for support before long. I've looked at the label again and it turns out it's not from Waitrose after all. I think I had mixed it up in my mind with the Apache F1 (just visible on the right in my previous post's photo). The Big Devil actually came from Bawdeswell Garden Centre (Norfolk, England). 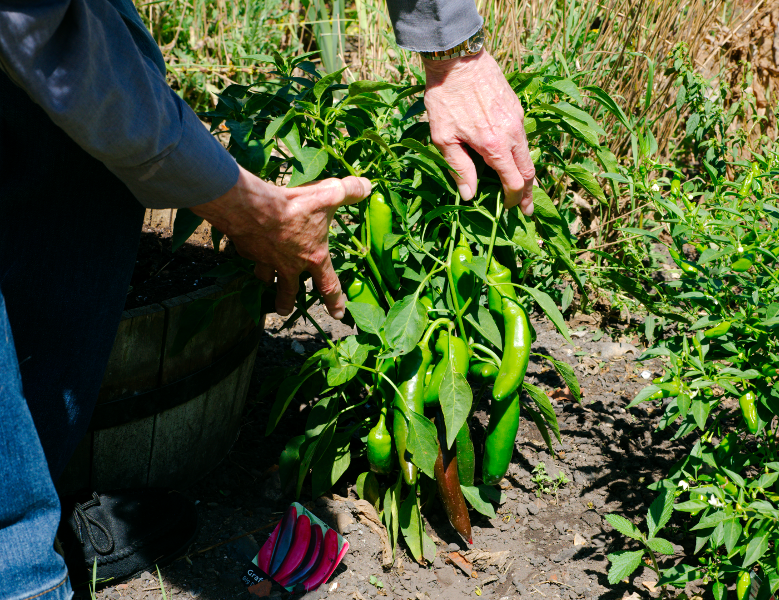 Update: Harvested two 'not-quite-ripe' chillis, mostly because they had reached the ground. 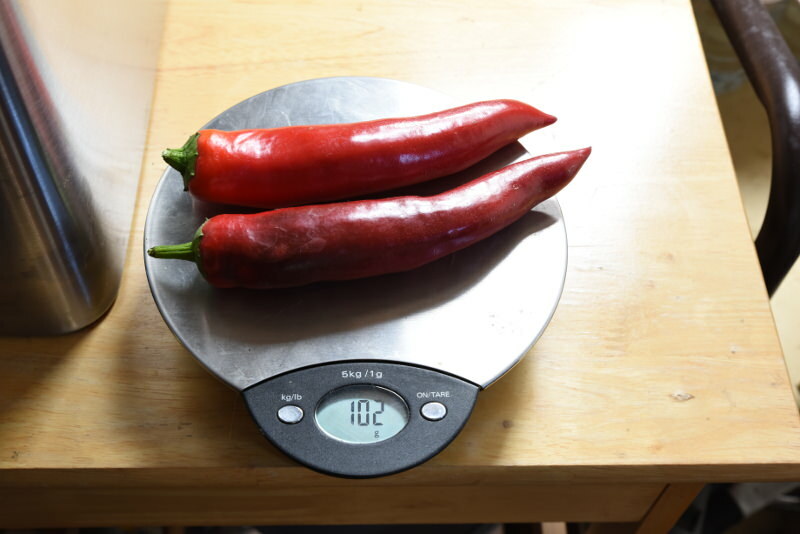 So, at just over 50 grams each, I estimate the total weight of chillis on the plant to be around 1 kg. I've adapted Flamethrower's suggestion for cooking to use Stilton instead - you've got to try this! 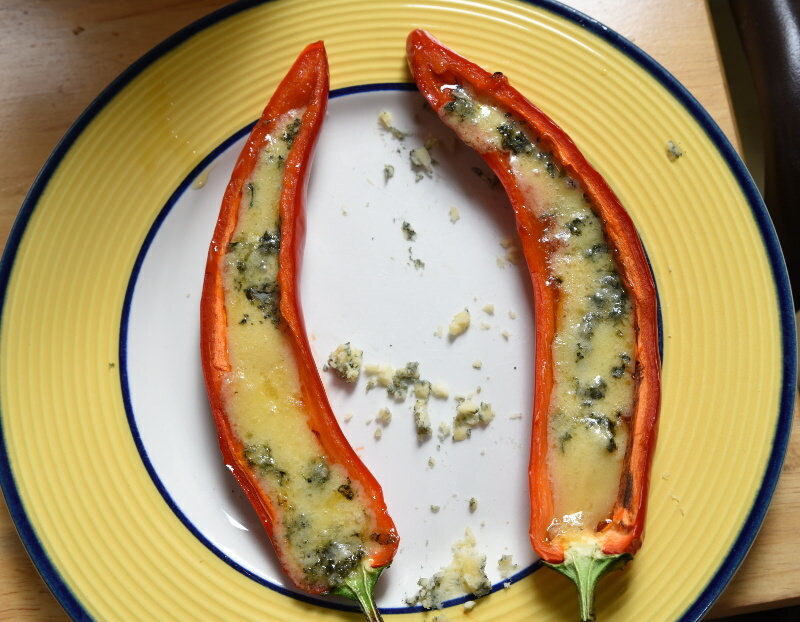 Edit: Changed image of Stilton Chillis for a less fuzzy one. The plate is 21cm (8.25inches) across.